Tripe. No one food stirs up so many emotions in me. The first emotion is joy, there's nothing quite like it to eat - the firm bite (like well cooked squid), the interesting texture, the way it soaks up flavours. It's hard to describe just how good it is and why it's that good. The next emotion is anger. If there's one thing food related that winds me up more than anything it's folk (adults really - one needs to cut kids a bit of slack) saying they don't like something before they've even tried it. Nothing sums this attitude up more perfectly than offal, in general, and, more specifically, tripe. So many people over here, if asked, will reply 'No, I can't stand tripe', so you reply 'What don't you like about it? The flavour? The texture?' to which you get in response 'I've never had it, it's just horrible and I know I wouldn't like it.' How exactly I wonder, as I've just said tripe is quite unlike most other foods. Plus what's the harm in trying? It's hardly poisonous, as demonstrated by the continued survival of the billions of folk around the world who do eat it. Even if they did stick it in their mouths and found it unpleasant I've read various research claiming it can take anywhere up to 10 times of eating for a person to like something. How many folk enjoyed beer the first time they had it? Are you glad you went ahead a few more times? Following the anger is shame, embarrassment in my lack of understanding for these people because, if I'm honest, I was in exactly the same position three odd years ago and for the 28 years preceding that. The thought of tripe turned my stomach. I remember being in a restaurant with my girlfriend, it was the Green Dragon on Gerrard Street, and it was the first time she'd met my mum and stepfather. I'd recently made the conscious decision to broaden my tastes, to put reason above any irrational or learnt dislikes, and a dish sat on the table full of wobbly white rectangles. We'd not ordered tripe but I had an inkling that was what it was and it took me a long time to put it in my mouth. I finally did though and was met with a lovely, gelatinous texture and meaty taste - alas a chat with the waiter revealed all I'd eaten was a it of boiled pigskin, different but nothing I'd not eaten before, even if prior to that it had been attached to a bit of pork. Soon after that though I did order some steamed tripe with ginger and from that point on I was a convert. Embarrassment is soon followed by pity because I know that not everyone will indulge in such a journey of self-discovery that I did, three years (and counting) of force feeding myself everything I was given the chance to, and because of that a lot of people will miss out on so many wonderful culinary delights. I've found my tastes are far from set in stone and if I put my mind to it I can eat, and normally enjoy, pretty much anything. It's so liberating. Back to tripe anyway. When tripe first sprang to mind, being offal, the obvious cookbook choice was the wonderful Nose to Tail Eating written by Fergus Henderson. Cited by many as one of the greatest cookbooks of our time, and legendary amongst chefs, it is full of traditional British dishes using everything from an animal one can. Flicking through the pages though the only recipe for tripe was tripe and onions and, as much as I like to eat everything, I think of roux-based white sauces as one of the low points of any cuisine. Back to the drawing board. All these decision, and most of this post for that matter, have been in my head for about 6 months and about 5 months ago, as mentioned here, I went to Peru and encountered a national dish called Cau Cau, a tripe and potato stew delicately flavoured with cumin and herbs. Fast forward to last weekend and I looked in my Peru cookbook and there was a recipe for Cau Cau and so I decided to give it a go and blog it. One word of warning though, last Sunday was the day after my girlfriend's birthday and so I was very hungover. As much as I like tripe it isn't the most pleasant smelling thing whilst cooking and on top of the hangover it really turned my stomach. If you are going to follow suit then bear this in mind. Also I don't think tripe is the easiest thing to get hold of for most people. 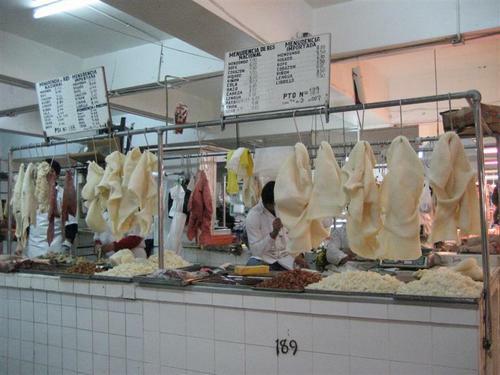 This country isn't blessed with the tripe stalls shown at the top of this post (this was Lima Market, Peru) but I managed to pick some up in London's Chinatown. Special occasions are always a bit of a balancing act with me. Obviously the first thing I want to do to celebrate - whether it be birthday, new flat, new job or Valentine's day - always involves food, either out or cooking. I have to remind myself that not everyone's obsessed with food like I am and so they may just want to have a drink or even, perish the thought, do something that doesn't involve the ingestion of solids or alcoholic liquids. As you're all aware the most recent occasion was Valentine's day. I'm not a big one for going OTT for this, no big presents or bunches of roses, although I'm happy to acknowledge its existence and happy to use it as an excuse for some nice food with the better half. Speaking with her she mentioned she'd like a pisco sour and some ceviche, memories of our last holiday, probably because the new screen saver at home pops up image after image from our Peru holiday and we both end up sat staring at that rather than watching the TV blaring away next to it. I looked up the local South American restaurant (Sabor in Islington - definitely worth a visit) but they'd taken the set menu route, without these dishes, so I decided to make it at home instead. The lack of cooking making it perfect for the evening as I wouldn't spend all my time in the kitchen. 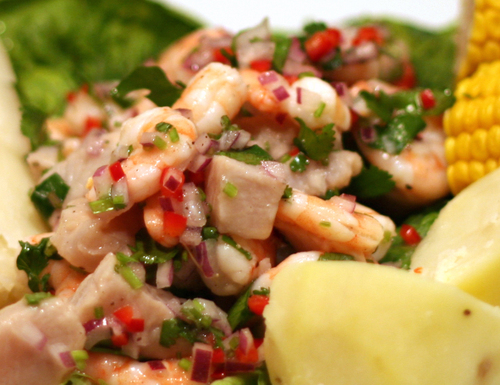 Back when I first spoke of ceviche I did prepare some to write about on the post too. I followed a recipe from a book I bought in Peru, alas what they translate to limes are actually a thing called a limon (I think) which although small and green is nowhere near as sour as our limes. Due to this the recipe I made was completely inedible and so I spared the write up. 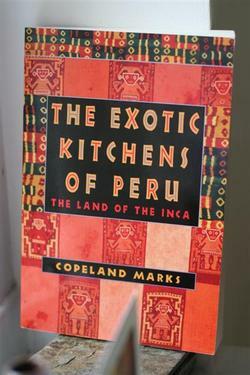 I was not going to be caught out twice though so checked out a recipe in a South American book that a friend of mine Kavey (who with her mum Mamta run the fantastic Mamta's Kitchen website) kindly bought me. 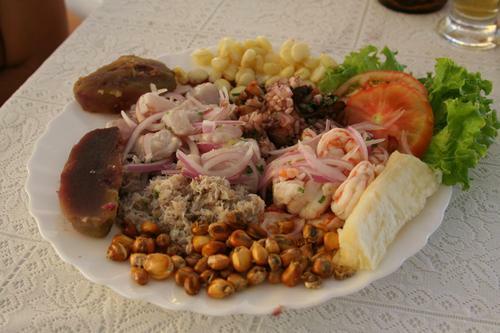 The recipe for ceviche in this used a mixture of the juice of two lemons and one lime so I used this as my starting point, and as pisco sours also use the same citrus juice I extracted six lemons and three limes' worth.